Conquer insecticide kills cockroaches, ants, spiders, flies, fleas, ticks, termites, carpenter bees, powder beetles, old house borers, and more, all while leaving behind a powerful residual effect that lasts and lasts! This concentrated insecticide is labeled for use in homes, businesses, USDA and FDA approved food plants and more. 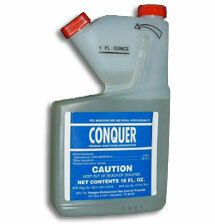 Conquer insecticide will truly "conquer" even your toughest pests! Would you like to see the Conquer Insecticide Label?